���Our long term future is very promising, in my opinion. However, economic issues have severely impacted the building industry, banks, utility revenue, debt service and operating revenue. Our banks are hurting more than the general public realizes. SEE Bankrate.com info below����������. Too often in the last 15 or more years, our schools have been used as a sales tool by realtors and developers. ������������..
Over the last several years, I have been critical of our county leadership- particularly on ‘fast-growth’ and spending policies. The criticism resulted from intimate knowledge of and experience with the county and its modern history. We had been on a moderate and manageable growth path. While I am not necessarily gifted with extraordinary vision or prescient abilities, my experience and observation did raise some concerns. Some of those concerns have been realized in the last two years. My service to our county and cities over a 30 year span was motivated by altruism, critics notwithstanding. I still have much pride and ‘ownership’ in my Native Oconee County. My plans are to be buried here someday. My overall feeling about Oconee County is positive and upbeat. Our long term future is very promising in my opinion. We can learn from and correct our missteps and continue on our path of having a good community. Economic issues have severely impacted the building industry, banks, utility revenue, debt service and operating revenue. Our banks are hurting more than the general public realizes. SEE Bankrate.com info …. 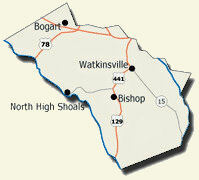 Oconee County has Ups and Downs and this article will address some of them. Unemployment is low and our (average) per capita income is high although not everyone earns in the high percentile of incomes. Oconee richest county & Highest but not richest. For February, the county with the lowest unemployment rate in Georgia was Oconee County, at 6 percent. We do have a great standard of living. UTILITY REVENUE is down (Graph.Oconee.Water.Sewer.Sales.6.3.08.pdf x) and we are now hoping that Atlanta water problems may relieve some of our debt pressure on Hard Labor Creek. I hope I am wrong but that seems more like “wishful thinking”. Lots of folks are speculating on how to supply water to Atlanta. At the same time UGA says it has enough water from Bear Creek Reservoir. Bear Creek water capacity expansion would have been the preferred option for Oconee County water needs. JAIL:Revenue downturns have demonstrated that we might have used overly optimistic growth figures in building our new jail. Excess capacity for 80 inmates is being negotiated with Fulton County. That will bring some revenue but expenses will increase with a larger population and will bring more ‘wear and tear’ to our new jail. However, the arrangement may help avoid the laying off of jail personnel. DOWNS: Too often in the last 15 or more years, our schools have been used as a sales tool by realtors and developers. It has involved prospects even touring the schools before buying a house. Our school faculties have enough to do without entertaining this type attention. Some officials bought into that philosophy resulting in promotion of growth of the system and sometimes building new schools in an area of ‘expected growth’. This policy has helped accelerate growth in rural areas. It has also stretched resources. Some of us had reservations about Oconee County needing a second High School in the late 90’s. However, ‘projections’ were used to justify building. Many population and revenue projections have demonstrated their failings with the economic downturn of the last couple of years. Rosy predictions of a fast recovery are also inaccurate. Oconee will not have houses on all its vacant, developed lots for many years. The recent incidents involving the North Oconee High School principal have exposed some of those problems. We will overcome these issues and have a bright future. We have a lot of county and school pride. A majority of our citizens have a high appreciation of education. This bodes well for our school system. ………..nearly 83 percent of Oconee graduates continue in school after graduation - ranking Oconee not only among the top counties in Georgia, but among the top counties in the country, according to UGA demographer Doug Bachtel.